When life gives you lemons…make lemonade. When Mother Nature gives you snow…harness up and take a sled ride! I like to use my horses for sled and wagon rides. It is good exercise for them and it allows me to disguise some goof-off time, into looking productive. Don’t get me wrong. It is a lot of work, getting the horses ready and hooking up. Then putting them away when we are done, but, I love to do it! I keep bells on my harness year round. I like to hear the tinkling when we are going along, no matter what the job. They sound real nice in the winter. It seems the sound carries on the crisp cold air. In summer the ringing bells just sound neat to me. I guess I’m just a little boy…and I’m ok with that! These last cold and snowy days, I have not done much except for chores and plow snow. Today, I took the horses for new shoes. We are getting things ready for the maple syrup season. I want anti-slip footwear on my horses at this time of year. A broken leg means a dead horse…a set of good horse shoes, with drill tech on the bottoms, are cheap insurance. Our stone drive is also hard on horse’s feet, once again the shoes are worth their cost. Each day, I work towards the maple syrup season. I check a few things off the list every week. The season comes quickly, I want to be ready, breaking the work into small jobs helps out a lot! 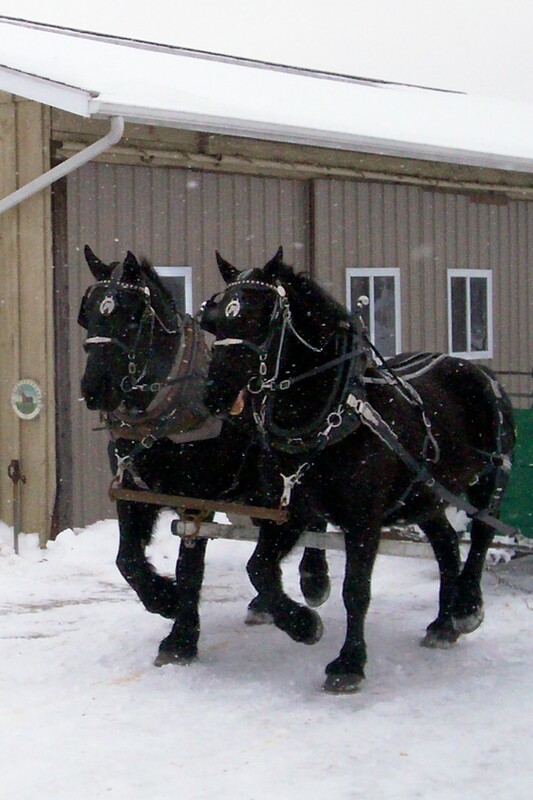 Using the horses on the sled or wagon, helps to get them in shape for the upcoming work. So, I get to goof-off, the horses get to trot and romp and all of us are one day closer to the syrup season! They are so beautiful Ralph! If you ever want some help grooming and hitching the horses for a ride, text me! I’ve never driven horses before but always wanted to learn. I will be hitching almost every day in March. I will indeed get you in on it. Thanks for the offer!